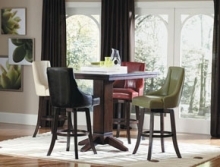 A high bar table is approximately 40 to 42" in height and is available in round and square shapes. 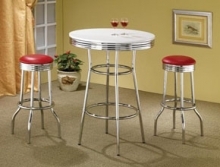 Round bar height tables and chairs are mainly placed in game rooms or kitchens and are great for entertaining friends and family, and they are available in both wood and metal. 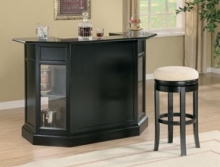 Wood bar tables and chairs are offered in many styles, sizes and finishes such as cherry, walnut and oak along with more contemporary finishes such as cappuccino or espresso. 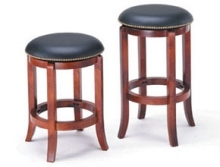 Metal pub tables and chairs feature glass tops and metal frames with matching swivel bar stools with foot rests. 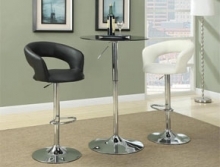 Small round bar tables and stools are stylish, elegant and will enhance your home decor.